A meteoroid is a solid body in interplanetary space before it reaches the Earth's atmosphere. A meteor denotes the fiery streak or "shooting star" which appears when a tiny meteoroid strikes the Earth's atmosphere and burns up. Most meteors result from meteoroids no more than a few centimeters in diameter. A larger meteoroid which survives the fiery passage through the Earth's atmosphere as a meteor and strikes the Earth's surface is called a meteorite. Meteoric material less than a tenth of a millimeter in diameter is called cosmic dust. A Perseid meteor on August 12, 1986. Meteors appear when centimeter-sized meteoroids travelling at least 11 km/sec, but more usually 30 to 55 km/sec, strike the Earth's atmosphere. The maximum speed is 72 km/sec. The meteoroid's kinetic energy of motion converts into heat, vaporizing the meteoroid at heights above 60 km. The hot vapor trail is what we see as a meteor. The vaporized material may reach temperatures of 1,000 to 2,000 Kelvins. The period during which the meteor flashes is called incandescent flight. The period after the light phenomena cease is called dark flight. Meteorites the size of a golf ball (two or three centimeters) or larger vaporize in exceptionally brilliant flashes called fireballs or bolides. These may also produce a variety of sounds. Theodor Abrahamsen's photo at the right captures a Perseid meteor on August 12, 1986. You can see five or six meteors each hour from any given vantage point on Earth when atmospheric conditions allow. Up to 25 million meteors arrive each day, dropping about 100 tons of material. Most meteors are composed of debris left behind by comets as they orbit the Sun. A meteor shower occurs when the Earth intersects a comet's path and moves through the stream of debris and dust emitted by the comet. The meteors in a shower appear to originate from one area of the sky called the radiant. The meteor shower is usually named after the constellation in which the radiant lies. Meteor showers occurs at the same time each year. 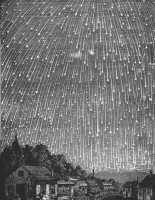 Common meteor showers result in ten to fifty meteors per hour. Typically the best time to observe is in the early morning. The following table lists a few of the more prominent meteor showers. "On the night of November 12-13, 1833, a tempest of falling stars broke over the earth.... the sky was scored in every direction with shining tracks and illuminated with majestic fireballs. At Boston, the frequency of meteors was estimated to be about half that of flakes of snow in an average snowstorm. Their numbers ... were quite beyond counting; but as it waned, a reckoning was attempted, from which it was computed, on the basis of that much-diminished rate, that 240,000 must have been visible during the nine hours they continued to fall." Periodic comet Temple-Tuttle is the parent (originating object) of the debris for the Leonid meteor shower. Leonids are among the fastest known meteors, striking the Earth's atmosphere at speeds of 71 km/sec on average. Curiously, no meteorite fall has ever been associated with a meteor shower. So far all meteorites observed to fall during a meteor shower followed different orbits than the material forming the meteor shower. Most meteoroids large and solid enough to reach the Earth's surface as meteorites are asteroid fragments. A few meteorites appear to be debris lifted off the Moon and Mars by large impact events. A handful may be fragments of comets. Meteoroids the size of a fist or larger may survive the trip through the atmosphere to land on the Earth's surface. They are then known as meteorites. A meteorite located after a witnessed descent is called a fall. A meteorite from an unwitnessed descent is called a find. Meteorites are usually named for a post office or another geographic landmark close to the place where the meteorite was found. The name of the meteorite can refer to either a specimen of the meteorite itself or to the locality in which it was found. Meteorites include some of the oldest and most primitive solar system material. Radiometric dates suggest some meteorites are as much as 4.54 billion years old. Some even include cosmic material formed before the solar system itself was born. Because many meteorites have changed so little in the intervening eons, they offer a window into the early history of the solar system. Meteorites also represent some of the rarest material on Earth. Until the advent of the space age meteorites were the only extraterrestrial material available for study here on Earth. Both the scarcity and the scientific importance of meteorites leads collectors and researchers alike to seek them out. Meteorites form three main groups based upon their composition. Iron meteorites are probably what most people picture as "typical" meteorites. Iron meteorites consist almost entirely of a mixture of metallic nickel and iron. They are easier to spot on the ground because their highly unoxidized iron content stands out from background rocks. The outer surface of iron meteorites often melts during their passage through the atmosphere resulting in a dark fusion crust. Primary fusion crust forms while the meteoroid is incandescent. Secondary fusion crust forms on the broken surfaces of fragments which break free from the main mass during incandescent flight. They may also exhibit flow markings and interesting molten metal shapes. The interior of some iron meteorites displays a criss-cross pattern of different iron-nickel minerals. Iron meteorites may originate in the cores of differentiated parent bodies at least 100 km in diameter. The composition of some main-belt asteroids called M-type asteroids resembles that of iron meteorites. These M-type asteroids may be the source of iron meteorites. Iron meteorites with weights of 50 to 100 kg are not uncommon. The Hoba meteorite, at 60 tons, is the largest known iron meteorite to have landed without exploding. It still lies where it was found. Stony meteorites are difficult to find because they look like terrestrial rocks. The best places to find stony meteorites are in deserts or on the ice sheet of Antarctica. The meteorites stand out against the background of ice or sand. Like iron meteorites, stony meteorites often exhibit a dark fusion crust. There are three major subgroups of stony meteorites, Chondrites, Carbonaceous Chondrites, and Achondrites. Chondrites are the most common type of stony meteorite. About 86% of all recovered stony meteorites are chondrites. Chondrites are composed of small spherical chondrules. Chondrules are millimeter to centimeter sized glassy mineral spheres. Chondrules are composed of silicate material that has melted and then resolidified. Chondrules formed early in solar system history. They were the most primitive "building blocks" of the solar system. Over time chondrules accreted to form larger and larger objects including asteroids, moons, and planets. In some chondrites the chondrules are separated by patches of iron metal. Different types of chondritic meteorites contain different amounts of metal. They have been heated to varying degrees. Chondrites are called primitive because they have changed very little since their initial formation early in the history of the solar system. Their composition resembles that of the Sun except that the lightest gases Hydrogen and Helium are missing from the meteorites. Ordinary chondrites are the most common type of meteorite, representing 87% of all recovered specimens. The parent body or bodies are unknown, but asteroids 6 Hebe and 3628 Boznemcová have been suggested as possible sources. Enstatite chondrites are metal rich meteorites in which the primary mineral is Enstatite. Enstatite chondrites may be fragments of asteroid 16 Psyche. Some scientists have suggested Mercury as the originating body. Carbonaceous Chondrites are essentially just pieces of chondrules stuck together. They are very black because of their high carbon content. Some of their mineral grains predate the solar system -- probably fragments blown out from distant stars that became supernovae. Carbonaceous chondrites also contain water and amino acids. Some types of carbonaceous chondrites may be cometary material. The building blocks of life on Earth may have been seeded by comets and carbonaceous meteorites early in Earth's history. For example, the Murchison meteorite, a fragment of which appears in the table above, was found in 1969. This carbonaceous chondrite contains 16 amino acids, 11 of which are rare on Earth. It may represent the type of cosmic visitor which early in the Earth's history brought the raw materials needed to jump start life. In some stony meteorites called achondrites the chondrules have been partially or completely destroyed by metamorphic processes. This took substantial time and pressure. Such meteorites must be fragments of the interior of larger bodies on which the weight of the overlying rock created enough pressure to obliterate the chondrules. About 7% of recovered stony meteorites are achondrites. Some achondrites resemble terrestrial igneous rocks and formed during volcanic eruptions on planets and asteroids. Some asteroids like Vesta heated up enough that their interiors melted and erupted lava onto their surfaces. The lava hardened into a rock called basalt. The Mt. Egerton meteorite (see table above) is a type of achondrite known as an aubrite. Some achondrites are composed of rock fragments broken and fused back together during an impact event. Meteorites believed to originate from the Moon and Mars are achondrites that formed during impact events. The achondrite Dar al Gani 476 (see photo of fragments at right) is a type known as a Shergottite. It probably originated as a fragment of the planet Mars blasted off the surface during a large impact event. The heaviest known stony meteorite was Jilin which weighed 1.8 tons. It fell in Jilin, China on March 8, 1976 as part of a meteorite shower (see below) which produced about four tons of meteoric material altogether. Witnesses of Jilin report a spectacular daytime fireball and several explosions. Jilin is classfied as an olivine-bronzite chondrite (H5). Because the Chinese leader Mao Zedung died three days after this fall, many Chinese took Jilin as an omen. Stony Iron meteorites are the rarest type of meteorite, making up about 1 to 2% of all recovered meteorites. Stony Iron meteorites consist of a mixture of rocky silicates and metallic nickel/iron. There are two main groups of stony iron meteorites. Pallasites are composed of olivine crystals set in a nickel-iron matrix. They probably formed in the boundary layer between the iron core and the stony mantle of an asteroid. Pallasites are very popular as jewelry when cut and polished. Mesosiderites are conposed of pyroxene, olivine, plagioclase, and metal grains. They probably formed when a metal-rich asteroid collided with a silicate-rich asteroid. A tiny meteoroid of whatever composition which is smaller than 0.1 mm in diameter is called a cosmic dust particle. The frictional heating which occurs during the descent through the Earth's atmosphere does not melt cosmic dust particles because of the large surface to mass ratio of such particles. Cosmic dust radiates away the heat which burns up larger meteorites. The Earth accumulates about 10,000 tons of cosmic dust each year. The Zodiacal Light, a faint pyramid-shaped glow extending away from the Sun along the plane of the ecliptic, is caused by sunlight scattered off cosmic dust particles. The gegenschein or counterglow which appears as a faint spot of light opposite the Sun is also caused by cosmic dust. Both are most visible early in the morning a couple of hours before sunrise. The cosmic dust particles causing the Zodiacal Light and the Gegenschein form a very low density cloud in the same plane as the planets. These particles slowly spiral into the Sun over time and are replaced by new particles emitted from comets and asteroid collisions. As noted previously, no meteorite has ever been known to fall from a meteor shower. This leads astronomers to disagree about whether any cometary material can survive passage through the Earth's atmosphere to reach the ground. However, the composition of some carbonaceous chondrites appears so similar to the expected composition of comets that such meteorites may be pieces of a comet. In particular, the class CI meteorites are often cited as potential comet fragments. There are only seven known CI class meteorites: Ivuna (see fragments at right), Alais, Orgueil, Revelstoke, Tonk, Yamato 82162, and Tagish Lake. For many years some believed these meteorites may have come from dormant comets masquerading as near-Earth asteroids. The entry speed would be low enough for meteoroids derived from such carbonaceous near-Earth "asteroids" to produce meteorites, even though these would be ultimately of cometary origin. Some suggest CI meteorites have a Martian origin, making them the oldest known Martian meteorites. Both of these origin hypotheses remain controversial. The most commonly held hypothesis is that CI meteorites are of asteroidal origin because of their similarity to CM class meteorites, indicating a similar origin process. The faster the meteoroid enters the atmosphere, the more the atmosphere slows it down. The effects upon landing depend primarily upon the mass and composition of the meteorite. As noted above, cometary material usually strikes the Earth's atmosphere at speeds between 30 and 55 km/sec, sometimes up to 72 km/sec. Most asteroidal material arrives at slower speeds, between 11 and 20 km/sec. This is one reason why cometary material rarely (if ever) reaches the ground. The higher entry speed of cometary material results in its more thorough destruction by atmospheric heating. Another reason is that cometary material is much more fragile than asteroidal material. The light phenomena of the meteor cease once the meteoroid is stopped by the atmosphere. Any remaining meteorite fragments not vaporized during incandescent flight fall subsonically in dark flight to the ground. When a meteoroid fragments in the atmosphere, the surviving fragments may rain down as a meteorite shower. (Do not confuse this with a meteor shower!) The fragments land in an elliptical region call the fall ellipse. Stony meteoroids are more likely to produce meteorite showers because they break up more easily than iron or stony iron meteoroids. For example. the Jilin, China daytime meteorite shower of March 8, 1976 was caused by the fragmentation of a stony body. However, the famous Sikhote-Alin fall of February 12, 1947 was a daytime meteorite shower caused by the fragmentation of an iron body with a mass of 70 to 100 tons. Witnesses reported a fireball brighter than the Sun around 10:38 a.m. The trail of smoke and dust stretched out about 35 kilometers and remained visible for several hours. The fireball flash and the sound of the fall were seen and heard over 300 kilometers away from the point of impact. The speed of entry was estimated to be about 14.5 kilometers per second. The meteoroid fragmented as it descended until it reached an altitude of about 5.5 kilometers. At this height the main mass of the meteoroid exploded violently. The fall ellipse formed by the meteorite fragments covered an area between one and two square kilometers. Bigger fragments produced at least 122 small craters and pits, the largest of which measured 28 meters in diameter and 6 meters deep. The table above shows a small fragment from the Sikhote-Alin meteorite shower. See Roy Gallant's article about the Sikhote-Alin meteorite shower for more information. Stony meteorites feel lukewarm at best when they reach the ground. Stony iron and iron meteorites may retain more heat. Eye witnesses have reported some stony iron and iron meteorites have scorched the earth around the spot where they landed, but most meteoriticists discount these reports. A giant meteorite too large to be stopped completely by the atmosphere may strike the Earth with much of its cosmic velocity intact. Such a meteorite may explode in the air near the ground causing an airblast or airburst, or explode upon contact with the ground forming a crater. The Tunguska event of 1908 was caused by the powerful airburst of a stony body or comet fragment several kilometers above the Earth's surface. The much smaller Sikhote-Alin impactor also exploded violently in an airburst. The famous Meteor Crater in Arizona resulted from the impact and explosion of a large iron meteorite. The Earth's atmosphere cannot prevent ground impact damage for stony meteorites greater than 200 meters in diameter. For iron meteorites that impact at greater than 20 km/sec, the critical diameter is about 40-60 meters. Stony bodies greater than 60 meters and less than 200 meters can cause significant airburst damage. How Dangerous are Earth-Crossing Objects? discusses the damage caused by giant meteorite strikes. Last modified by pib on March 15, 2014.